13 1ST READER - cont'd Point out to them how the nominal winner is often the real loser--in fees, expenses and waste of time. As a peace maker, the lawyer has a superior opportunity of being a good man. Never stir up litigation. A moral tone ought to be infused into the profession (loudly to MR. X,) which should drive such men out of it." HEAD COUNSELOR "That's enough...we have not acted on Malcolm's readers, request for a days leave." 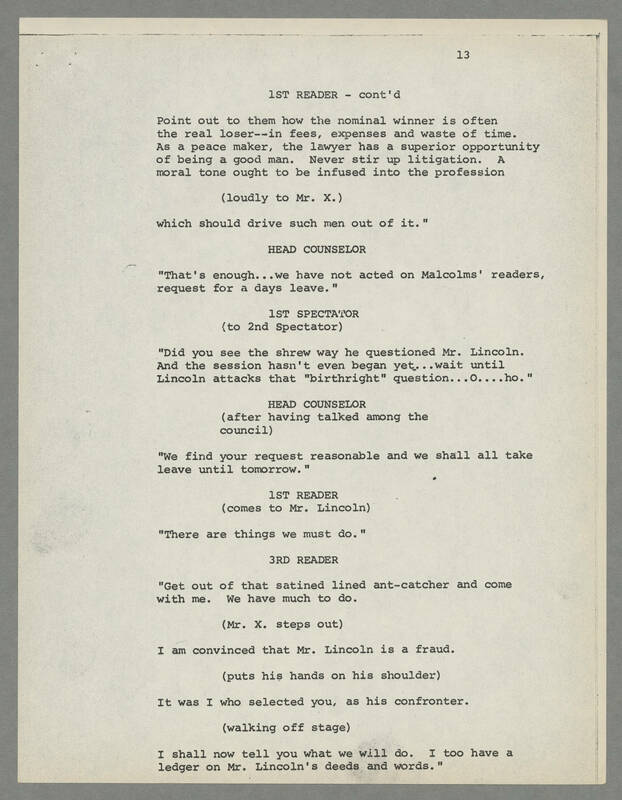 1ST SPECTATOR (to 2nd Spectator) "Did you see the shrew way he questioned Mr. Lincoln. And the session hasn't even began yet...wait until Lincoln attacks that "birthright" question...O.....ho." HEAD COUNSELOR (after having talked among the council) "We find your request reasonable and we shall all take leave until tomorrow." 1ST READER (comes to Mr. Lincoln) "There are things we must do." 3RD READER "Get out of that satined lined ant-catcher and come with me. We have much to do. (Mr. X. steps out) I am convinced that Mr. Lincoln is a fraud. (puts his hands on his shoulder) It was I who selected you, as his confronter. (walking off stage) I shall now tell you what we will do. I too have a ledger on Mr. Lincoln's deeds and words."